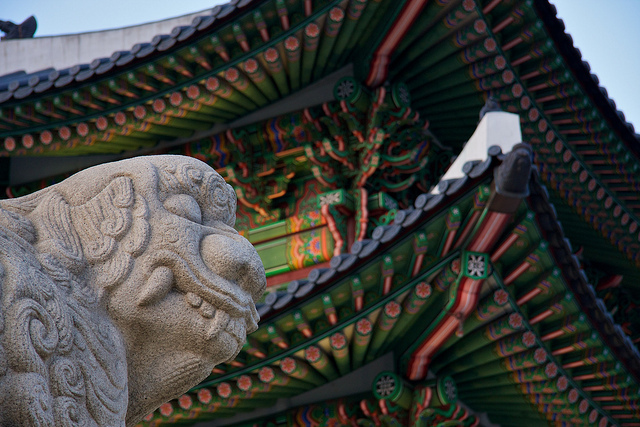 Korea is a beautiful country owning a rich history and an abundance of traditional customs. Discovering the gems hiding inside the long history of Korea is always a task stimulating the curiosity and interest of the visitors. Among many ancient relics from Joseon Dynasty, Gyeongbokgung palace might be the most representative of them all. 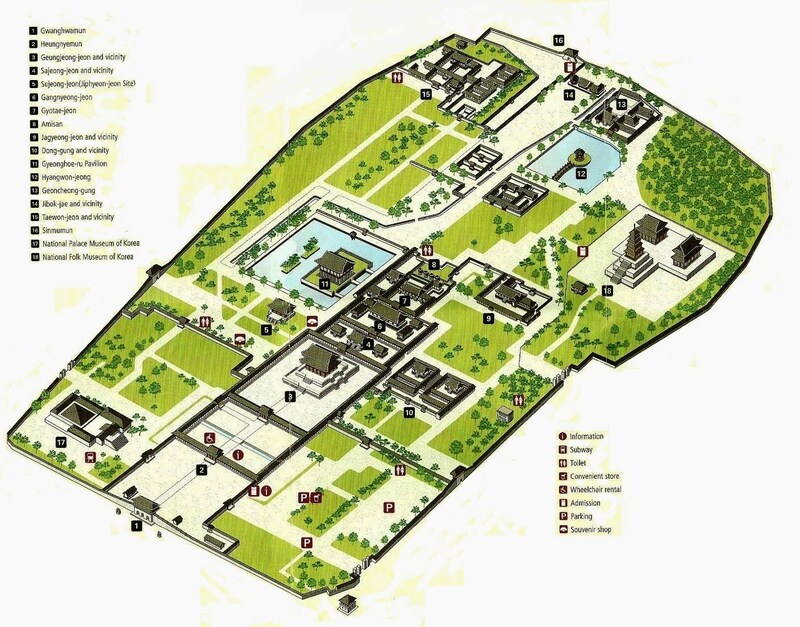 Let’s take a look at the Gyeongbokgung palace map and look at some detailed guides to visit this palace. Gyeongbokgung Palace also has other names as Gyeongbokgung Palace or Gyeongbok Palace. This was the main royal palace under Joseon dynasty as well as the largest one among five grand palaces that still exist. This palace was built in 1395 and used as the residence for the Kings, the Queen, and the concubines. Gyeongbokgung Palace was built by King Taejo who was the founder as well as the first king of Joseon dynasty. 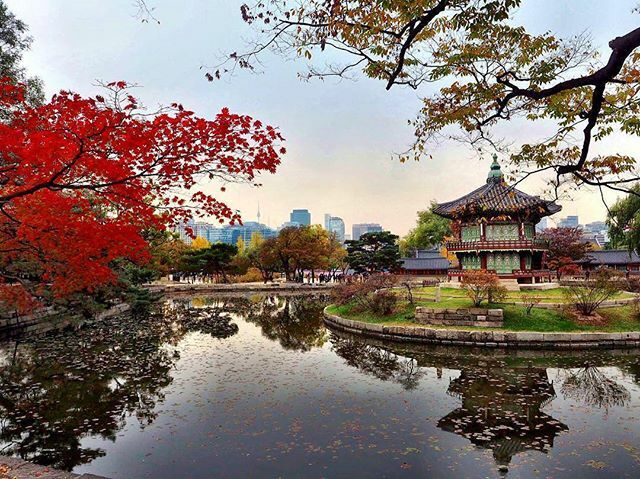 It is convincing to say that Gyeongbokgung was the first step toward setting the foundation of a dynasty. Although it was destroyed during the Imjin war, it was restored during the reign of King Gojong. During the war with Japan, this grand palace was destroyed yet again, before later being restored gradually to its original form. Inside the Gyeongbokgung complex, there is the National Palace Museum of Korea and the National Folk Museum combining together to become a large complex with high historical and architectural values. Gyeongbokgung palace map is very big with many buildings and detailed to explore so that you should draw the way to go step by step in order to have a wise choice to visit as much place as you can in limited time. First step, you will enter the complex by going through the main gate (the southern gate) of Gyeongbokgung Palace: Gwanghwamun. This gate was built in 1395 in Joseon dynasty and lately became the main gate as well as the most important gate that time. It is one of the icon image of Seoul after being rebuilt many time destroyed by the war. This is the place you buy the ticket to enter the complex. However, in other gate on the east of the palace, there is another ticket booth placing here. However, you should not buy the ticket here. In the main gate, the palace also provides you the free guides but actually it is not really effective because you will go in group of over 50 people so that you can not hear or see anything if standing in the end. If you want to get more details about Gyeongbokgung palace, you can take the brochure freely from the gate or take the private tourist guide. However, if you think that going with a large group of people will be more fun, a free guide from the gate is quite acceptable. After passing Gwanghwamun gate, you will enter the second gate – Heungnyemun. The next place after visiting Geunjeongjeon is the place that was used by the King and the cabinet of Joseon Dynasty named Sujeongjeon. Sujeongjeon located to the south of Gyeonghoeru Pavilion. Gyeonghoeru Pavilion is the place holding the most important state banquet in Joseon Dynasty. This place also was used to welcome the important foreign visitors as envoys from other countries. After visiting Gyeonghoeru, you will go to the next destination named Sajeongjeon. 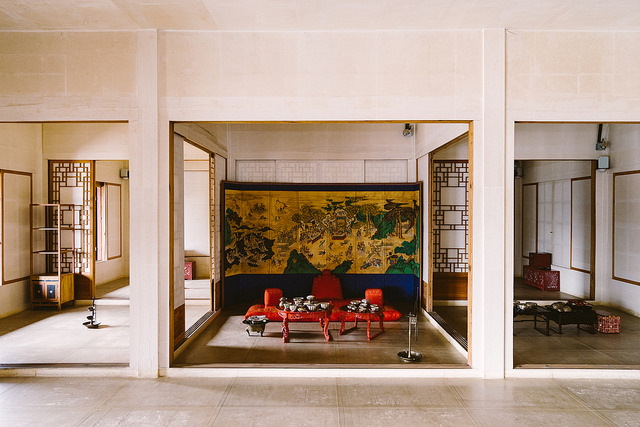 Sajeongjeon is a hall that was built to be the main executive office of the King. This was the place the King held the meeting with the most important officials and solve the national problems. On the west of Sajeongjeon is Cheonchujeon while on the other hand is Manchunjeon. 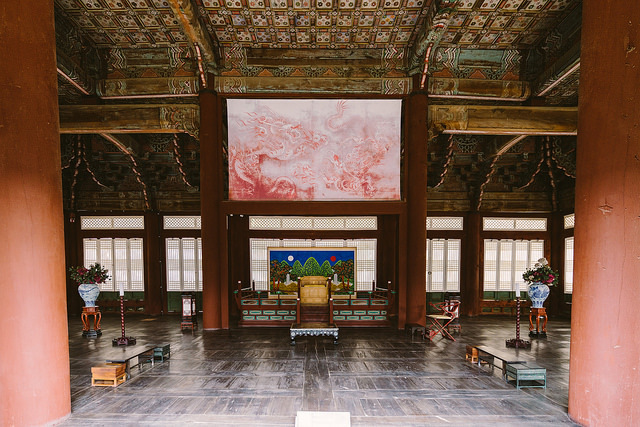 The next place on your tour to Gyeongbokgung Palace is the main residence place for the King. It is Gangnyeongjeon building. It was first constructed in 1395 and destroyed after the war. However, they restore this building in 1994 to be the tourist attraction. 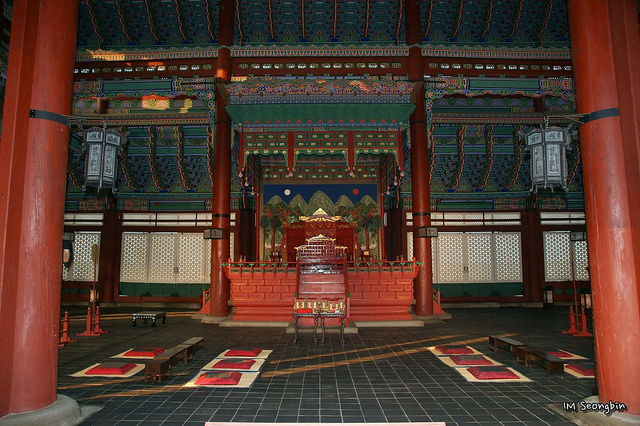 Gangnyeongjeon has 14 rectangular chambers and corridors. 14 chambers are divided into two sides with 7 chambers on each side. The court attendant used these 14 chambers to protect, assist, serve the King and receive the order from him. The King used the central chamber of the building. The next place on your visiting trip is Gyotaejeon. Gyotaejeon Hall was the main residence of the Queen – the most powerful woman in the King’s harem. Different from other concubines, the Queen had her own place to live. That was Gyotaejeon. The queen’s building was built behind the King’s resident building. King Sejong built this hall in around 1440 for his queen because of her privacy. The reason for this construction is that because the bad health of King Sejong, he needed to work and meet with the officials in his residence – Gangnyeongjeon instead of Sajeongjeon as before. Because of that, he decided to build a separate building for the queen. Next place is located behind Gyotaejeon. That is a garden named Amisan. This garden is always colorful by the decorating of terraced flowers. However, the most featured characteristic of this garden is the beauty of the artificial decorations. The most special work among them is four hexagonal chimneys made from orange bricks. These chimneys had no function but decorating to the garden. The next place you will visit after the King and the Queen’s building is the King’s mother’s building – Jagyeongjeon. King Heonjong built this building for his mother, Queen Sinjeong in 1865. Especially, this is the only building among royal residing quarters that was not destroyed in the war. The chimneys as the decoration in this building are decorated by the pattern representing the wish for longevity life for the late queen. The structure of the building also focuses on protecting the late queen’s health and her comfort. The southeast part of Jagyeongjeon was designed to be cooler in the summer while the northwest part was designed to be warmer in the winter. 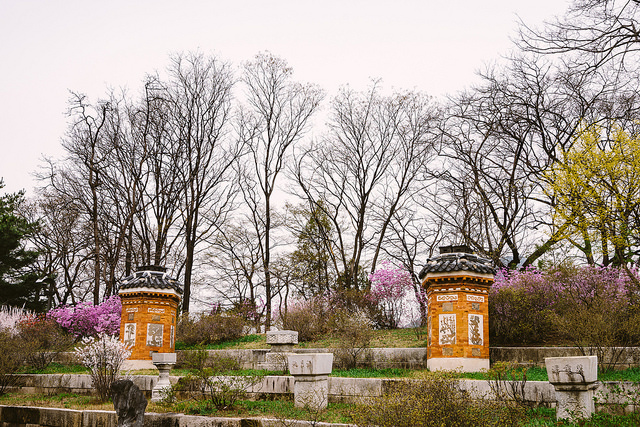 Hyangwonjeong Pavilion (which means Pavilion of Far-Reaching Fragrance) includes two-story hexagonal pavilion built on an artificial island in the middle of a lake on the northern grounds of Gyeongbokgung Palace. The name of the lake is Hyangwonji connected to the ground by a bridge named Chwihyanggyo. Coming to this part of the palace, you can admire the harmonious combination of the artificial constructions with the beauty of nature around. The next place that you should visit in Gyeongbokgung palace is Jibokjae. Stand out from other buildings in the palace, it was not the residence or meeting place. It was the private library of King Gojong. The meaning of the name of this building in English is “Hall of Collecting Jade”. It reflected the fondness for learning of Korean people under Joseon dynasty. The point makes this building become distinctive is that it was deeply influenced by Chinese architectural style. On the left of the building is a pavilion named Parujeong. Parujeong is the place for storing the books. On the right of the building is Hyeopgildang used as a part of the main building Jibokjae. This place opened in 1992 exhibiting the variety of relics from Joseon Dynasty. According to the figures, there are more than 20,000 relics being displayed here. These relics were collected from 3 grand palaces (Gyeongbokgung Palace, Changdeokgung Palace, Changgyeonggung Palace) and Jongmyo Shrine. National Folk Museum of Korea is the building with Gyeongbokgung palace displaying the historical relics of the Korean people under Joseon Dynasty and their traditional life. The number of artifacts in this museum is more than 98,000. These relics saved the information about the life of Korean people include 3 main parts: History of the Korean People, The Korean Way of Life, Life Cycle of the Koreans. This museum also displays some traditional items from the Koreans’ daily life. 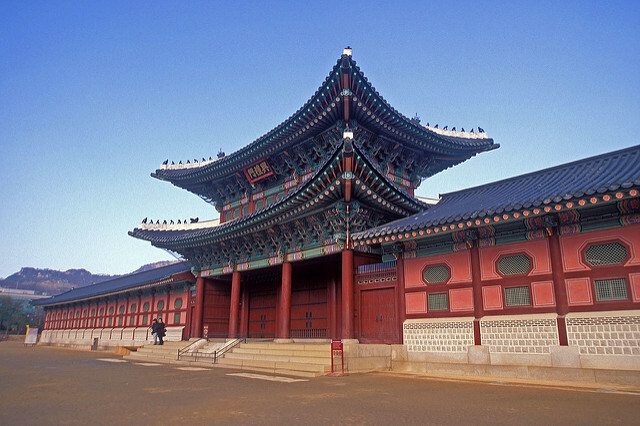 There are some different choice for you if you want to get to the Gyeongbokgung palace. If you want to experience the Korean transportation as a local person, try the Korean bus. If your starting point is in Jogno, you can take the bus 11 to go to the palace. You will get off on the east side of the palace. From there, you can walk to the main gate and buy the ticket to visit the palace. If you depart from a destination in the city, you can choose between 109, 171, 172, 601, or 606 on the blue city bus line or the 1020 or the 7025 on the green line. The price for the bus’s tickets is quite acceptable so that you do not have to worry about that. If you do not want to be late and you want to get there early, the subway is also a good choice. You will take the 3 line to Gyeongbokgung station and the exit is 5. From there, it will take 5 minutes to walk to the palace. Grabbing a taxi is also a convenient way to enjoy your trip. You do not have to be bothered by other people and do not have to worry about the hustling crowd. Not much taxi drivers in Korea can speak English so that do not forget to bring the map with you to show them the destination you want to go. 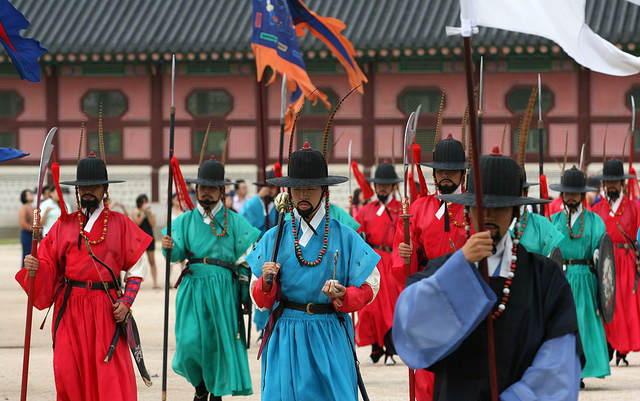 The royal guard under Joseon dynasty was responsible for protecting the capital and the royal palace. Because of this responsibility, they were also responsible for opening and closing the gate of the royal palace. The royal guard worked by shifts that divided into day shift and night shift. When the guards changed their shift, you can see the changing of the guard ceremony. Nowadays, if you go to Gyeongbokgung palace on time that they open the gate, you can see the changing royal guard ceremony. The gatekeeper wearing traditional clothes, handling traditional weapons will change the shift when they hear the bell rings. If you have a chance to go to Gyeongbokgung, you cannot complete your tour without watching this ceremony. The scenes that you may see before in Korean movie now are in front of you. 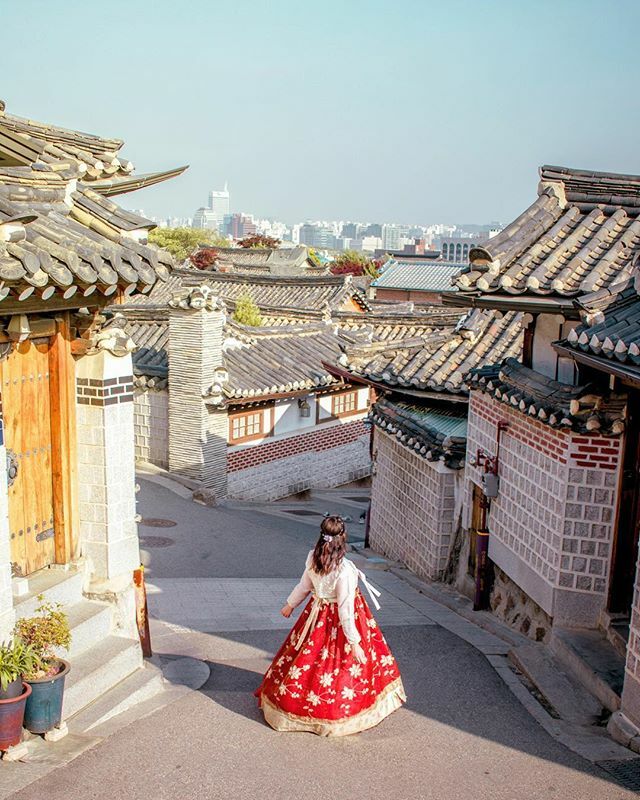 In Gyeongbokgung, you can try the traditional costume for rent here. The costume will cost about 30000 – 50000 won for a day. You can find these costume in the shop outside the palace. However, you can rent the traditional costume inside the palace which is free for you to wear in 15 minutes. You can take really fun pictures with the costumes because it is really big for you. If you want to have the experience as an ancient Korean people, you should not miss this thing. Moreover, in order to encourage the visitors to wear the traditional costume, Gyeongbokgung will let you go inside without paying money. After spending a half of a day in the largest royal palace, you should find other places near this palace to fill in your timetable. Bukchon Hanok Village is a traditional village near Gyeongbokgung palace. This place has hundreds of traditional houses (hanok in Korean). Bukchon in its name means northern village. After exploring the Gyeongbokgung Palace, Bukchon Hanok Village will be the next suggested choice. Exploring the lives of the normal people after seeing the luxury lives of the royal family will help you have an overview of Joseon Dynasty. After a day going around, you need time to relax and refresh to be ready for the next tour. Samcheongdong is filled with many restaurants to satisfy your stomach and many accessories shops for shopping. Insadong is a street selling souvenirs from the postcards, bookmarks, notebooks,… that you can buy as the presents to bring back home. On this street, you even can buy for yourself a hanbok with your name sewed on. Why don’t you buy something for yourself and your family from this amazing street? 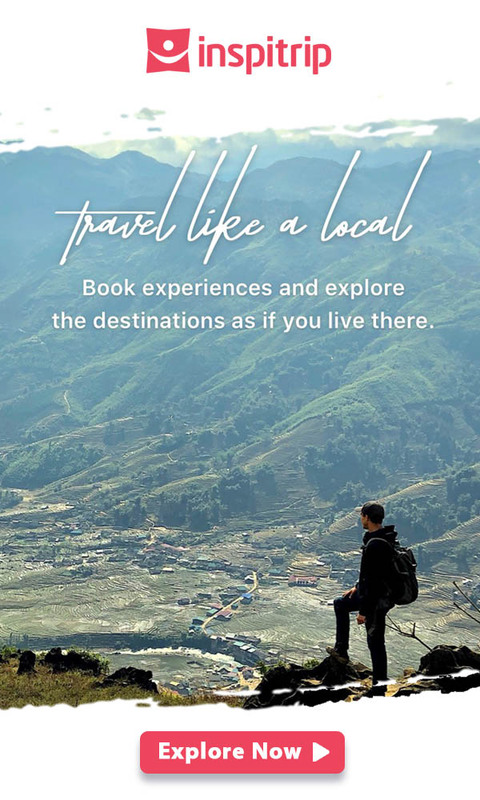 If you are a foreign visitors and this is the first time you have visited this country, booking a tour is a wise choice. You do not have to worry about the accommodation, the tickets to get into the Gyeongbokgung Palace and the transportation that you have to use. Besides, you do not have to get a headache while considering which places you should go and which places you should focus. As we said before, free guide in the palace cannot satisfy your curiosity about the palace because it will be the obstacle if you go with a large group that you do not know anyone. The brochure can provide you the basic information but it can not show you the details that you may miss. Because of that, we provide you some tours that you can choose to make your vacation full of happiness and satisfy your hunger for historical information. If you just have a chance to go, make it best. 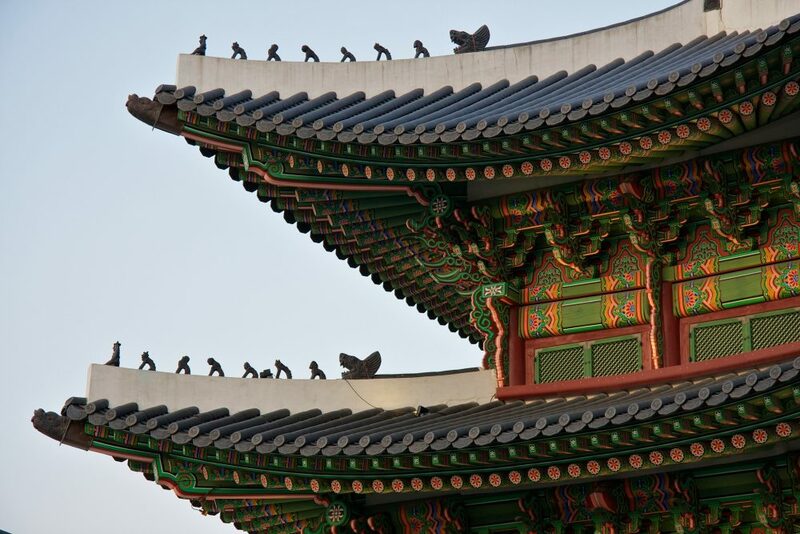 We highly recommend you to book the Seoul city tour which just costs 36 USD/ person. The tour will include Gyeongbokgung Palace, Jogyesa Temple, and more.